Recently I've got into candles in a big way! It may be me turning into a middle-aged woman, or the fact that when the weather is depressing outside candles make indoors feel more cosy, or maybe candles are simply just nice. Whatever the reason I'm having a bit of a moment with candles! I can't really take credit for this find. My mum bought me this as a bit of a 'welcome home' present after travelling. 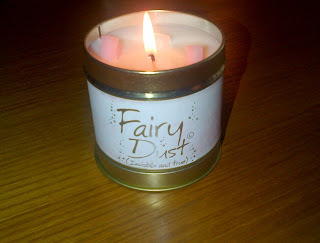 Lily Flame candles come in countless scents but mine is called Fairy Dust. Super girly and hand-made these candles are really beautiful. Pretty enough as a gift or just to treat yourself, Fairy Dust smells amazing. Why haven't they invented smell-o-vision for the internet yet?! It smells quite powdery, and I guess what you'd expect fairy dust to be like. You'll just have to hunt them down and smell for yourselves. But take my word, you won't be disappointed. They've apparently been around since 1997 but I had never seen them before. Made in Somerset, they're a true English find. 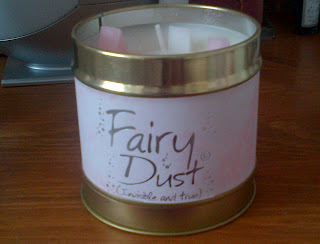 As well as this scent I also like Blush, Bluebell Forest, Gardenia and Parma Violets. But they have a very extensive range to suit every taste.